Serious question though, cant Russia make its own Mistrals ? I think if the deal goes sour, that is what they'll end up doing. They obviously could and have the know-how, the problem is just that all ship building yards are occupied already which are already in delay and planning to build an own helicopter carrier will end up only having it by 2025+, so that is the reason why they just tried to make a deal to get it ASAP instead of lining up all projects and ships they need. Russia hasn't anymore the industrial capacity it had as Soviet Union. Thanks for the picture, never seen 30mm as a side armament. If it does indeed carry the 30mm and the 4 barrel 7.62, it just adds to what the helo can do. Then again, having both of them increases weight, which reduces range, payload etc. 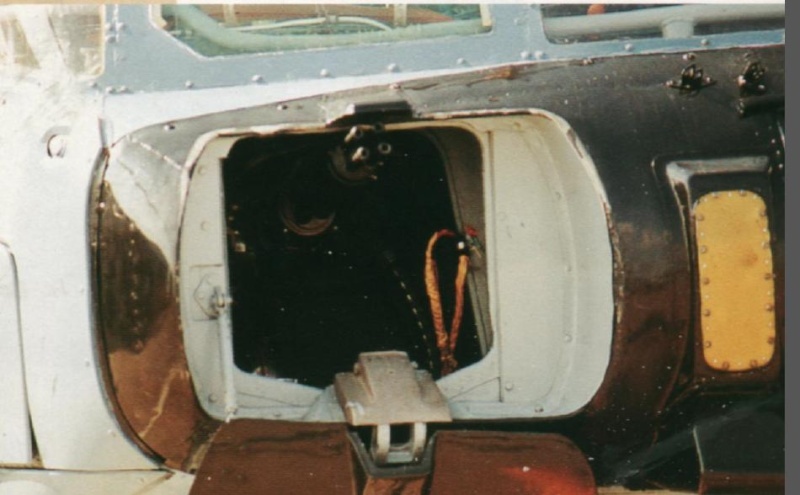 AFAIK the 30mm is an option but not a common option as the cabin will be used for troops... not 30mm cannon shells. It is funny we talk about missing things on Kamovs... it reminded me of a discussion I had years ago on Key Publishing where a member was positive that the Helix had no belly doors for torpedoes and depth charges... just because he had never seen one he believed they did not exist... I found a photo of it but didn't bother posting it because that was how he learned new information... by challenging others to find it for him... so when I found a decent picture I didn't show him... does that make me evil? 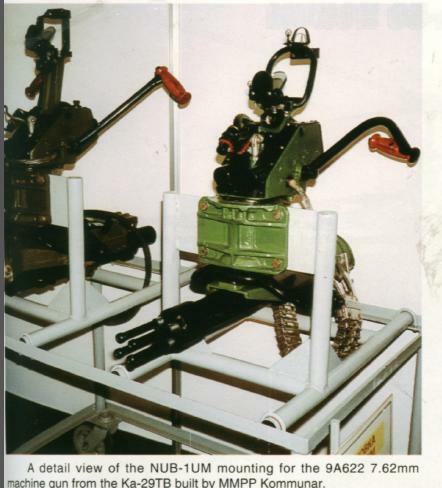 I dont think Mil is going to make anything similar to the Ka 31 for army use. It is a variant of the naval AEW aircraft so I doubt Mil will bother... if the army wants some it will likely just buy Kamovs. But then again, cant tell much from the camo. it is a pitch to the army so they made it up in camo suitable for the role. They just added an active defense system on the Mi 8 that helps it dodge incoming missiles, i guess IR seekers. There is progress but because all the companies got merged into a government-private conglomerate i dont think we'll see intercompany competition. Maybe they'll integrate the electronics suit to a Mi 8, may the Ka 29 will get the active defence system. What ever aircraft they choose for service will likely get active defence systems like the Ka-52 and Mi-28 will get. I rather doubt the Army is interested in the Ka-29. GarryB wrote: ... so when I found a decent picture I didn't show him... does that make me evil? I have a somewhat similar approach; I continue providing whatever information I can, but once I realize the person ..., I stop my participation. Actually i found out the whole deal with the Kamov Ka 29. Once i get interested in something, i'll go to the extent of finding out every single nut there is on that thing. Thats just me though. Figured out where what was and all. The part where the nose piece just pops off and the gun comes out and starts shooting is really fun to watch, like some James Bond movie stuff. No, it doesnt make you evil if you keep some intel away strategically. It helps you access how much the other party knows. You go on from there. I had a discussion about the Tu 160 entering production again, and the person i was talking to said they should wait for the PAF DA. I just told him in a few lines that the PAKDA doesnt come into service before 2025 and having more Tu 160s is a good idea. The guy didnt understand, so yeah i left the discussion. It is very much like a strategy game... right now you have x number of slipways and x number of shipyards able to build big ships and work on big ships. You have some old big ships and you want some new big ships and you want some new carriers. If you upgrade your old big ships you get much more capable big ships which are useful for all sorts of things but you tie up your big ship shipyards. Brand new big ships will take a decade to perfect and design and get into service in numbers, while new carriers will take just as long if not longer. If you start building new carriers now you will likely find yourself in the mid 2020s with carriers but not enough big and medium sized ships to actually support proper operations. regarding the White Swan the problem there is that I have seen estimates that the first prototype PAK DA would fly in 2019... which isn't that far away now. I would estimate that if you decided right now to build a new factory to make all the components of a Tu-160 as it is now would cost a small fortune and also not necessarily be ready for full production by 2020. 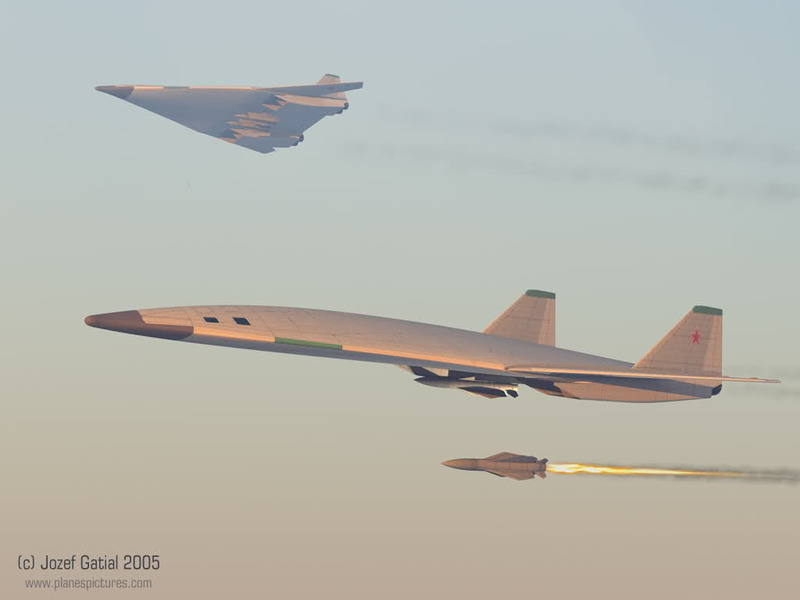 By the time you produce your first new Tu-160 the PAK DA should be getting very close to serial production... and to be honest I would rather see that money invested in creating an aircraft factory able to build a large aircraft to the precise accuracy needed to make an aircraft stealthy. Personally I would prefer a scaled up PAK FA type shape except with the nose pushed back into the wing so the leading edge of the wing is like an angled V shape that could be fitted with an enormous long wave band radar to detect stealth aircraft... that way the PAK DA could also be a long range stealthy AWACS aircraft... and with the weapon load replaced with electronics it could be a Jstars, and a maritime patrol aircraft with enormous loiter time, and of course with the entire payload replaced with fuel it could be an inflight refuelling aircraft... and with super cruising capability it could easily be a Tu-128 like heavy interceptor with enormous range, mach 1.6 speed and an enormous number of AAMs and of course that huge anti stealth radar... they might end up making 400 of them... with 100 as strategic bombers... 100 more as inflight refuelling tankers that take off with the heavy bombers and refuel them and then land and arm with theatre nuclear weapons and refuel and hit targets in europe, maybe 50 AWACS, 25 JSTAR, perhaps 25 for special world wide stealthy missions like transporting special forces, plus say 100 interceptors and 100 maritime patrol aircraft. See in the game i usually end up actively waging wars and capturing more shipyards over time to maintain my dominance, i dont think Russia can do that, without starting a global war. I am going all fiction here, but its possible that Russia and China initiate a common ship building process, like the Brahmos for example (with India). China makes/upgrades ships, Russia provides technology so Chinese put it in their other ships too. Its a strategic decision but yeah like i said, Chinese already have a very active ship building industry, but like i said its ALL FICTION. I cant comment on if they should build new ships or upgrade old frames because i dont know their naval forces very well. Yeah i could very well tell you what is what with weapon systems but i dont have much on how their navy operates 'tactically'. PAK FA, PAK DA, PAK TA, right now its only T 50 and an aging fleet of Tu 95s, Tu 160s, Tu 22M3s. I would personally recommend upgrading the Tu 160s with new electronics and ECM equipment while actively developing the T50. See what this does is provide an active test bed for the new electronics. Like the radars that you talk off or of ECM suites. The Tu 160 gets better functionality, longer service life and the T50 gets battle tested or time tested equipment. And then once PAK-DA advances to final stages, they can convert the Tu 160 factories to PAK-DA factories. Is this really the final design ? Ofcourse assuming it has an internal weapons bay and the artists made it to look cool. With their ships their future vessels will be fully standardised... so instead of having ten different anti ship missiles they will have UKSK launchers which can launch a range of anti ship and land attack and anti submarine missiles. they will also have standardised SAM launchers that launch a range of standard SAM types, so an upgrade to the old vessels with these new unified launchers as well as the integration of the Sigma system (Russian AEGIS) and standardised sensors and propulsion upgrading their old vessels actually makes them easier to use.. The Kirov class carry Granit which is no longer in production and the Slava class carry Vulkan which is not being produced now either. Fitting UKSK both can carry Onyx now and Zircon in 10 years time. The new compact nuclear reactors can be tested in them and once perfected will be used in future new large vessels including carriers. Tu-22M3 and Tu-95MS and Tu-160 are all getting upgrades to Tu-22M3M, Tu-95MSM, and Tu-160M standard. With development of new radars for PAKDA and new engines the potential for further improving the Tu-160M is there... new engines and radars can be used on the Blackjack and the Backfire. Not even close. That is the T-4MS, which was an aircraft design by Sukhoi... based on their Mach 3 recon plane design the T-4 but the whole design was passed on to Tupolev to build because Sukhoi was too busy with the Su-27... Tupolev rejected the design and built their own design... the aircraft we now call the Tu-160. This approach makes sense. I just read on SputnikNews (i dont know if its considered a credible source here or not) that the Tu 160 will undergo modifications and the aircraft will almost be renewed. All thanks to KRET. Modernizing current warships and aircrafts as long as they are serviceable, fall within safety regulations is a cost effective measure till Russia can begin making a new armada of weapons from scratch so to speak. This way they can gradually test the new equipment, integrate it with existing systems and install them on new platforms with rather ease. This is like a whole new approach to war-fighting and deterrence. "The Tupolev Tu-160 strategic missile carrier/bomber will be equipped with an advanced radio-electronic warfare system, which is highly effective against anti-aircraft missiles, Russia’s Concern Radio-Electronic Technologies (KRET) reported. KRET is developing a new aircraft guidance system, a targeting and navigation complex, a weapons control system and other electronic equipment. A total of 800 firms and organizations are involved in the modernization of the Tu-160 aircraft. KRET companies are designing engine control and fuel consumption systems as well as a maintenance service which would help the crew in force majeure situations." It looked too much like the Sotka, that is why I asked. It is a bit like Ratnik... in the past the manufacturer who made helmets had no contact or communication with the companies that made other equipment... they just made helmets. With Ratnik however everything is considered together so the Helmet will protect the head of course but is designed to be used with communications equipment and optics and will be designed with the rest of the body armour to use the latest materials and leave as few gaps in protection as possible. Now everything is being developed this way so the Radar manufacturer for ships wont just be making a radar for one weapon system, they will likely be making a range of sensors for several weapons systems and to provide information for the on targets and threats for the shared battle management systems. Equally electronics suites have traditionally been designed for specific aircraft... you may have noticed shared numbers like the Kh-23, the R-23, are weapons developed for the MiG-23, but the radar and defence equipment also included 23 in the codename. Electronics suites for aircraft have the name avionics... a combination of aviation and electronics... there is no equivalent term for land vehicles, but the Russians have developed it so over time expect a new name to be developed for it. The different vehicle families they have developed each have electronics suites shared to reduce costs and increase commonality. I rather doubt they have even totally finalised the design of the PAK DA even now so these drawings... which are pure speculation are likely inaccurate... especially the PAK DA.... a subsonic flying wing does not need the complication and weight penalty of a swing wing.... and like I said the design shown is the T-4MS which has already been rejected 30 odd years ago. Thats how the T72 family was at one time, you had the T 72 MBT, TOS-1 on a T72 Chasis, you have Buk or any ADS on the T 72 Chasis, then you had the BMPT on the T72 chasis, also some troop transports on the T72 chasis (I think they are called BTR-T) but i maybe wrong, so all in all, everything on a T72 chasis. Well i dont think they shared electronics or anything but they shared the same chasis, so logistics for these vehicles were pretty simplified, you can interchange parts as and when needed, no different spares, no different fuel. But yes, the commonality on the electronics is a great thing. It cuts down on logistics cost, training cost, replacement cost. Plus if you are throwing in prototype models, you have a test bed Just as we discussed. Regarding PAK-DA, i dont really know. These are the images i found making rounds. I am waiting for the Tu160M upgrade, wanna see where it goes I believe it will directly or indirectly raise the bar for the PAK DA too. Lets get back to helicopters. Just look at it turn. Just read on RT that the Nuclear capable Mi 14 is going to make a comeback soon, along with the Tu 160.
" The new version of Mi-14 is likely to get new engines, advanced avionics and modern electronics. It is expected that modern version of Mi-14 will have better floating stability than its forebears." Also this might be old news but the Chinese have an equivalent of the Ka 31 AWACS deployed on the Mi 17 frame. In the longer term it would be interesting to see a naval version of the Mi-38 optimised to the role the Mi-14 performs... with modern digital electronics they should be able to equip it with all sorts of equipment. How the Ka-50 ejection system works in DCS World a Belsimtek product of the former well known USSR (belarus) company who made and still makes military simulators for military. They have pilots, engineers, phycists and pioneers working to make military simulation on high fidelity degree. Ka-52 ejection system real life tests.